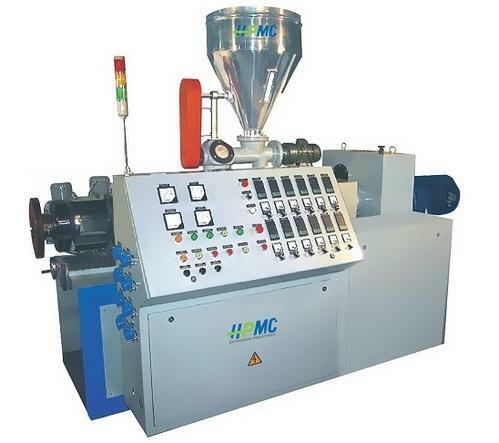 PVC Conduit Pipe Extruder (Two Pipes) offered finds use in processes involving electrical piping and underground ducting among others. 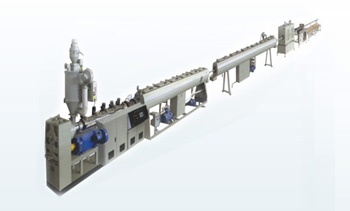 Backed by advanced technology support, these pipe extruder plants allows production of twin pipes of two different diameters simultaneously using single mould support. Other than this, these plants also come supported by special conical twin screw extruder for allowing high filler loading, dual pipe vacuum tank for consistent production even in cases when output is from single pipe, separate vacuum pump and water pump for two different vacuum chambers, dual pipe die head for low production costs, special flow channel design for allowing equal distribution of PVC in both moulds and others. Some of the other end uses for pipes manufactured using this plant include for drain-waste-vent (DWV), sewers, water mains, water service lines, irrigation, conduit as well as in various industrial installations. Electrical piping system Underground duct Features Separate vacuum pump and water pump for two different vacuum chambers. Dual Pipe Die Head. 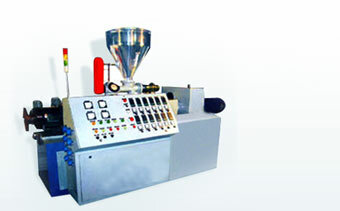 It ensures the production of dual pipe out of one mould,thus making the cost of production low. It has reasonable flow channel design and special treatment on the surface. Special flow channel design ensures the equal distribution of PVC in both moulds. Melt temperature and pressure remain even. Dual Pipe Haul-off - Its construction ensures the traction of two different pipes at two different speeds thus enabling the production of pipes of different diameter. Drive is given through four geared motors to all four belts and synchronized with the help of AC frequency variable drive. Gap between two tracks is adjusted through pneumatic cylinders. Dual Pipe Cutting Unit - Its construction ensures the cutting of two pipes at different length and at different time. Length of the pipe can be set with limits switch of tipping chute. Functioning is PLC controlled. Bi-metallic screw & barrel can be provided for getting two-three times more lifespan than nitrided screw & barrel. Dual pipe vacuum tank ensures the production of one pipe does not stop,even if the production of second pipe is stopped due to any reason.Thus,making the wastage low.It is made of stainless steel. Separate vacuum pump and water pump for two different vacuum chambers. 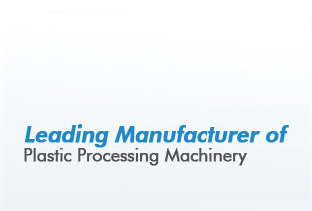 It ensures the production of dual pipe out of one mould,thus making the cost of production low. Its construction ensures the traction of two different pipes at two different speeds thus enabling the production of pipes of different diameter. Drive is given through four geared motors to all four belts and synchronized with the help of AC frequency variable drive. Its construction ensures the cutting of two pipes at different length and at different time. Length of the pipe can be set with limits switch of tipping chute. It is provided with two individual unloading tables, so that both the pipes are stacked at different locations.